Updated October 21: Rahm has dropped the plan to privatize 311, but explained that the offer was less about saving $1 million annually than it was to upgrade the tech. I still don’t think it was explained well enough – or challenged enough by City Council – why a privatization was the “only” way to get an upgrade worth $25-50 million, or why the upgrade would cost that much. Then, there’s still the open question as to what happened to the RFP in 2014, looking for bidders to create a new 311 system. I’m also curious if any of the nascent civic-oriented CRM and Open311 startups would have a reasonable chance at responding to an RFP or privatization effort, or if the RFP process would largely exclude new or small players. There are over 300 service request types (codes), of which many are available to the public (the rest being for internal or aldermanic use). Here’s the full list of codes and the department that administers or manages the requests. The topic of analyzing 311 data came up tonight at ChiHackNight, and I talked to a DePaul University Student interested in using their predictive analytics study on this rich (maybe) dataset. I brought them up to speed on the changes made to the 311 technology system and created this “status” document to demonstrate the wild and whacky year of changes in 2012, and the stagnation since then. I’m publishing this because I also want to collect ideas and feedback about things I don’t know regarding the progress in redeveloping the tech that powers Chicago’s 311. Code for America fellows come to Chicago and work with DoIT to develop 13 service request types (codes) for Open311, a layer on 311 that enables third-party apps to submit new service requests – with photos. See what other cities have adopted Open311. I pled with the Chief Technology Officer at the time, John Tolva, holding a new position in the mayor’s office, to enable 5 of the bicycle and pedestrian-related codes in the Open311 system, so that I can build apps for Grid Chicago, and later, Streetsblog Chicago, readers to request city services that impact the safety and quality around walking and biking. Ben Sheldon, one of the four Code for America fellows, made SuperMayor.io, and it’s one of the few Open311-based apps that’s still working (most of the apps linked to from this Smart Chicago Collaborative blog post are dead). The City of Chicago releases an RFP to remake the 311 system (September). One aspect of operating the system I noticed that better tech could probably have a big impact on is the number of service request taken by phone: 74%! 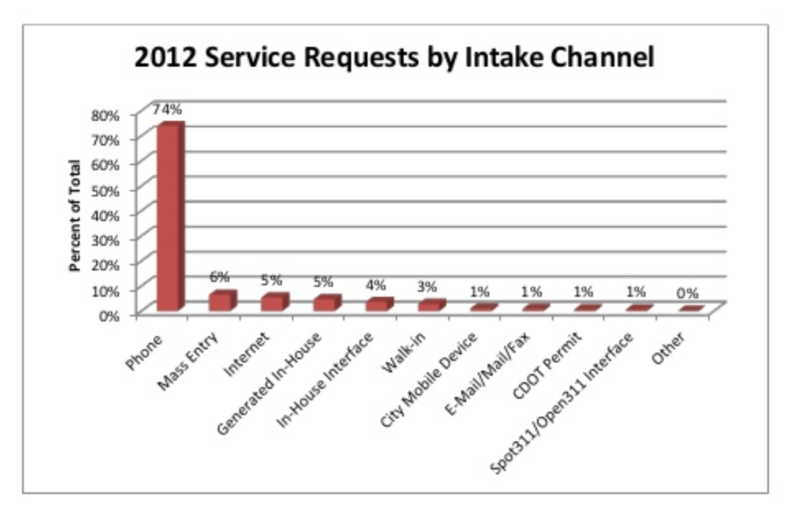 According to the RFP issued in 2013, 74% of service requests are taken by phone. Only about 6% are done through the web. Companies respond to the RFP (I assume). Are these responses hosted anywhere? Smart Chicago Collaborative made Chicago Works For You, a dashboard that’s also the only Chicago + Open311 map. 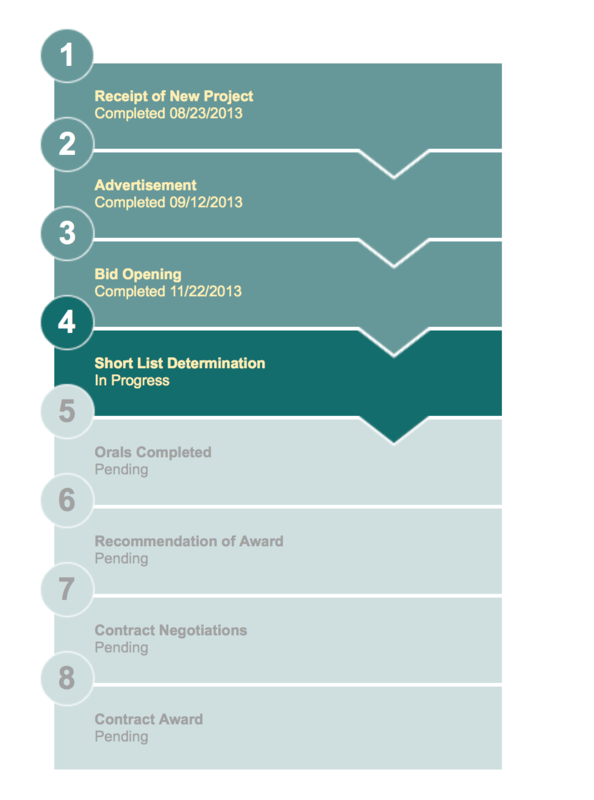 The RFP never made it past “Step 4” in the Bid Tracker, or, “Short List Determination”. The Bid Tracker is really unhelpful at this point, though, because it doesn’t mark the date at which Step 4 was reached. The helpful (to a point) Bid Tracker for the 311 RFP. Mayor Emanuel announces a proposal to privatize the 311 system, including the technology and the staff, to be able to pay for the tech upgrade. Emanuel says it would save the city about $1 million annually. Aldermen don’t like this. While I haven’t read up on their specific complaints, I believe they have to do with the quality of the jobs that would exist under a private operator. Currently the 73** employees work for the city and have benefits like healthcare and probably some retirement assistance. The new jobs could be, well, anything, and if they’re like other call centers, probably pay less and could have worse benefits. There’s also the question of whether anyone else can actually do the same (or better) job for less money (a question that 6th Ward Alderman Roderick Sawyer raised). That means someone other than people in the mayor’s office need to be able to get a detailed look at the expenses of the 311 call center and tech. Andy Shaw questions why the privatization proposal is coming up now: “The timing is odd because the administration recently sent an enlightened privatization ordinance to the Council for approval, so it’s logical for the city to wait until it’s analyzed, and then adopted, before embarking on new privatization initiatives” and “the ordinance has 40 aldermanic co-sponsors but hasn’t been heard in committee yet, so it’s premature to consider privatizing 3-1-1”. Shaw suggests using the do-nothing legally-separate-entity Chicago Infrastructure Trust to upgrade the service. (The new board members Emanuel installed this year have “set an ambitious goal”, Shaw said, to convert the city’s streetlights to something more energy efficient. It would likely work by splitting the cost savings with a private contractor. ** The city’s salary dataset on the open data portal lists 56 employees with “311” in the job title. They collectively earn $3,519,732.00 annually. Thank you to Derek Eder, Eric Sherman, George Nakhleh, and Dan O’Neil for the discussion and links. Updated Monday, Oct. 12 to add quotes from Better Government Association’s Andy Shaw (a former investigative reporter for a TV station). When the Slow Roll Chicago project in the transportation breakout group began in December at Hack Night, the emails started flying right away. This was mainly because there was a lot to say at the start, as we needed to agree on the group’s mission and plan. Problems using email started immediately, though. Not only were there many emails going back and forth among people listed on the TO and CC fields, there were people who weren’t able to take part in these discussions. That happened because it was difficult to keep track of who had been added to the discussion and who hadn’t, especially when it came to integrating new members of the group. I wanted to overcome these problems by using a proper collaboration tool. Using email made it impossible to see what tasks people were working on, and the progress they were making at any given moment. Finally, email tends to be private but our work needed to be public so that it could be independently verified but also replicated for use in other locales. I believe that it’s easier to train people on how to use a new tool well than to retrain on how to use an existing tool – email – better. GitHub has solved all of these problems for our group while also creating a secure and versioned programming code storage system for the final outcome: a website. Hack Night being a tech-oriented meetup is a good reason to use and teach this modern tool widely used by people in technology industries. Many of our members are still learning it but they have support from people within our group and from others who attend Hack Night. When you want to discuss a new idea, like using dynamic images to show what a building could look like under certain conditions, you would make a new “issue”, titled, “Use dynamic images to show the user some building design possibilities”. Use rich text and images in the issue to describe and visualize the idea. GitHub has granular notifications settings that alert project members to this new “issue” after which they can respond to your idea. After it’s decided that the issue should be resolved in a specific way, you can assign the issue a desired milestone (a future project version) and project members. One milestone could be “Preview to the management team” which is a previously-discussed status that should happen in a couple weeks. A second milestone could be “Post-launch” – things to finish after launching the product – that’s defined offline. Each milestone tracks the issues that you’ve associated with it so you can see progress. When the assigned members finish a task, they “resolve” the issue by closing it. Need documentation? For many coding or GIS projects, a data dictionary may be necessary and GitHub provides each project repository with a wiki in which you would describe how the project is set up, and what certain fields or values mean. Finally, GitHub can store files – any kind, and as many versions. If you need to update a CSV file of street addresses for the project, just make the edits in your preferred editor on the desktop and then “commit” your changes with a short description of what you changed. Sync this commit back to the repository so that all project members now have access to the file. Walking directions from my house to the Divvy station at the CTA California Blue Line station, and then from there to the Divvy station at LaSalle/Illinois Streets. Lastly, there’s walking directions to some arbitrary N LaSalle Street address. Adam Gluck and Andrew Beinstein showed up at OpenGov Hack Night on July 16, 2013, to show off the technical concept of their forthcoming app for iOS devices. I looped them into the Divvy app-making progress I and others were undertaking (documented on a shared Google Doc). They said they would make their app was going quite different from all of the eight apps for using Divvy that have since launched before theirs: it would offer directions for walking to the nearest Divvy station with available bikes, directions to the Divvy station nearest their destination with open docks, and then walking directions from that end station to their destination. Chicago Bike Route launched Friday last week. Currently only three of the eight iOS apps released before Chicago Bike Route have routing. CBR takes directions to a new level by giving you directions from where you are to where you want to go, and not necessarily from a specific Divvy station (like my Chicago Bike Guide does). Instead, CBR gives you complete directions between origin and destination and smartly picks the nearest Divvy station with available bikes. Now, I believe most often this will just be the nearest Divvy station, period, as it’s relatively rare for a station to lack bicycles. 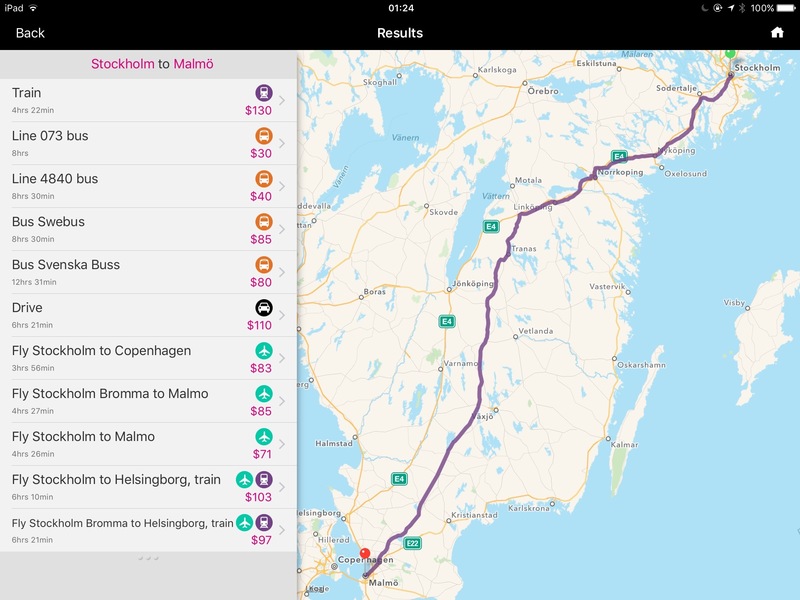 The app uses Google Directions and for every trip makes a maximum of three calls to their API; counts against the app’s free quota from Google. The first call gets walking directions from the origin to the nearest Divvy station with available bikes, and the second call gets bicycling directions to the Divvy station with available docks nearest the destination, and the third call (assuming the destination isn’t that Divvy station) gets walking directions from the end Divvy station to your destination. The next step, I believe, is to have the app use a prediction model to accurately choose the end Divvy station. A lot can happen at that Divvy station in the 30 minutes (or whatever) it takes to get there. It may not have open docks when you arrive. Two other suggestions I have: an improvement to the autocomplete destination function because it didn’t recognize “Chicago city hall” or its address, “121 N LaSalle Street”; and adding a “locate me” button. Additionally I’d like them to add some basic resources to advise users on where they can get more information about Divvy or bicycling in Chicago. Adam and Andrew are going to publish a “dock surfing” function in the app that will incorporate multiple segments on Divvy to make a trip longer than the free 30 minute period. This would probably mean a fourth call to the Google Directions API. I emailed Adam and Andrew to learn more about the app development. Video of Beinstein and Gluck presenting their app to Hack Night. Created by Christopher Whitaker for Smart Chicago Collaborative. Why did you make Chicago Bike Route? We made the app because we wanted to make something civic related. We thought that Divvy was an exciting new civic program coming into existence, and we kept seeing it all over the place. It also solves a real problem in public transportation that we notice and hear about a lot living in Hyde Park called the “last mile problem.” We also had the data in our hands from having attended civic hack night at 1871 when Divvy came and we thought “let’s make a native Divvy app!” And that’s what we did. We also released a framework for interacting with the Divvy API natively for developers who don’t want to get their hands dirty playing around with the iOS frameworks. What makes your app stand out from the pack? 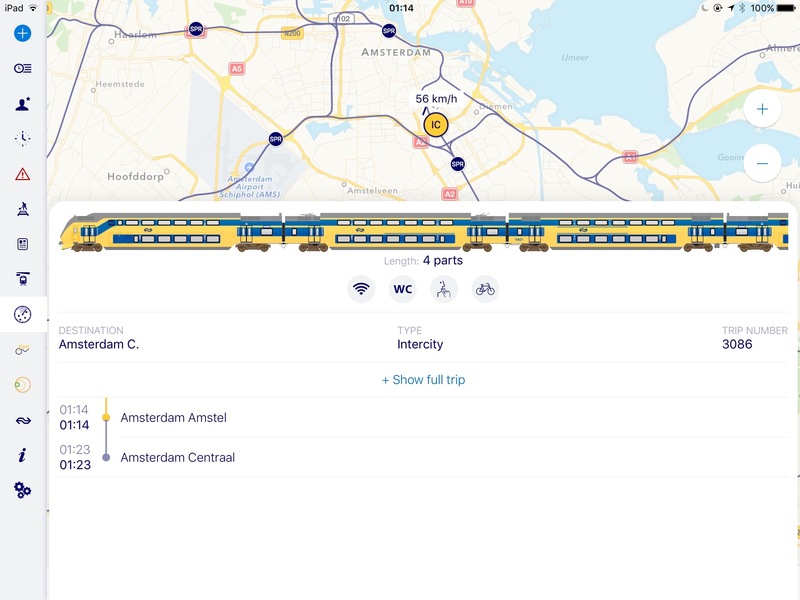 I think the routing but also the simplicity of design of the app. We wanted it to be something you could just open up and use and was like all the other mapping utilities that one has on their phone (Google Maps, Apple Maps). And that’s what we did. You open it, enter an address, and you get routed to that address. Something that people could use to get up and running with Divvy with basically no familiarity with the system. What features are you planning for the future? Bike surfing! Seriously though. We think that it would be a really useful feature for some people, and also help reduce the cost of using the bikes. It would be useful for the regular riders where the $2 additional charge could really add up but also if you are someone who is not part of the program and are just taking the bike out for a joy ride. It can actually get kind of expensive, since every half hour after the first hour in a half is an additional $8, rather than $4.50 for members. You would also be less familiar with the bike stations under that situation. We also need to integrate with Chicago public transportation. But, we also want to keep with the simplicity, and create a user experience with basically no learning curve, and we are a little cautious to throw something in that could complicate things. This interactive map was created for a Grid Chicago article to show the cities and Amtrak routes mentioned. Click and drag it around or hover your mouse on the red train station markers. All shapefiles are from the United States Department of Transportation, Bureau of Transportation Statistics’s National Transportation Atlas 2012 edition except for Illinois places, which comes from the Census Bureau’s TIGER project. At the end of this tutorial, you’ll have a good introduction on how to find geographic data, build a map with TileMill, style the map, and publish it for the public. Your map will not look like mine as this tutorial doesn’t describe how to add labels or use the hover/info feature. Unzip the four ZIP files you downloaded and move their contents into a folder, like /Documents/GIS/Amtrak Illinois/shapefiles. This is your project folder. Install TileMill and open it. Set up a project. In the Projects pane, click “New Project”. In the filename field, title it “amtrak_illinois”. Ensure that the checkbox next to “Default data” is checked – this shows a world map and helps you get your bearings (but it’s not absolutely necessary). Get familiar with TileMill’s layout. Your new project will open with the map on the left side and your Carto style code on the right side. There are four buttons aligning the left edge of your map. From top to bottom they are: Templates, Font list, Carto guide, and Layers. Add a layer. We’re going to add the four shapefile layers you downloaded. Click the “Layers” button and then click “Add layer”. In the ID field, type in “amtrak_routes”. For Datasource, browse to your project folder and find “amtrak.shp” – this file has the Amtrak route lines. Then click “Done”. Click “Save & Style”. Style that layer. When you click “Save & Style” after adding a layer, your attention will be called to the Carto style code on the right side of TileMill. A section of code with the “amtrak_routes” #selector will have been inserted with some default colors and styles. If you know CSS, you will be familiar with how to change the Amtrak routes line styles. Change the “line-color” to “#000”. After “line-color”, add a new line and insert “line-opacity: 0.5;”. This will add some transparency to the line. Press the “Save” button above the code. Add remaining layers. Repeat Step 5 and add 3 more layers: “amtrk_sta.shp” (ID field: “amtrak_stations”), “state.shp” (ID field: “states”), and “tl_2012_17_place.shp” (ID field: “illinois_cities”). Hide bus stations. The Amtrak stations layer shows bus and ferry stations as part of Amtrak’s Thruway connections. You probably don’t want to show these. In your Carto style code, rename the #selector from “#amtrak_stations” to “#amtrak_stations[STNTYPE=’RAIL’]”. That makes the following style code only apply to stations with the “rail” type. Since there’s no style definition for things that aren’t of that type, they won’t appear. Change project settings. 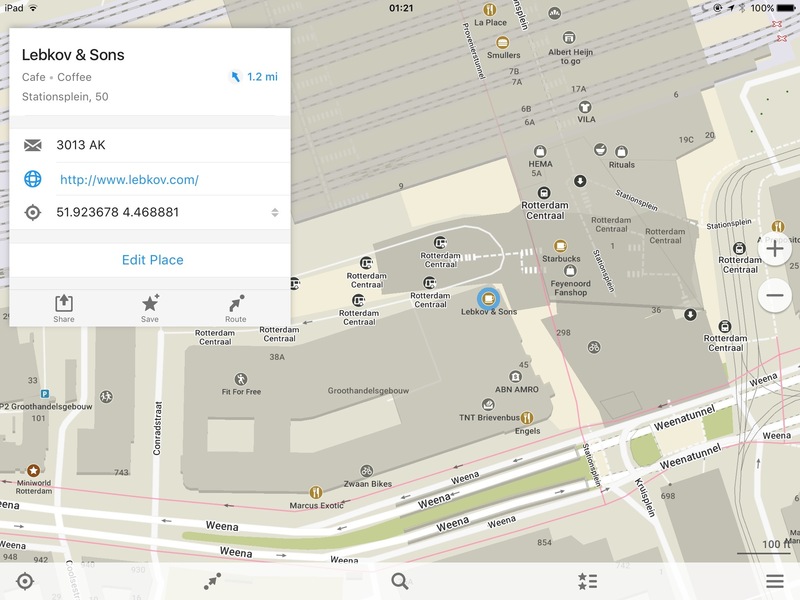 To upload to MapBox, you’ll have to export your project as MBTiles, a proprietary format. Click the “Export” button above your Carto style code and click “MBTiles”. You’ll be asked to provide a name, description, attribution, and version. Input appropriate text for all but version. Adjust the zoom levels. Adjust the number of zoom levels you want (the more you have the longer it takes to export and upload your project, and you might exceed MapBox’s free 50 MB account limit). My map has zoom levels 8-11. Adjust the bounds. You’ll then want to draw your bounds: how much of the map’s geographic extents you want to export. Zoom to a level where you can see the entire state of Illinois in your map. Hold down the Shift key and drag a box around the state, plus a buffer (so viewers don’t fall of your map when they pan to the edges). Export your map. Click Export and watch the progress! On a four-year-old MacBook it took less than one minute to export the project. Bring the export to your project folder. When export finishes, click the “Save” button and browse to your project folder. Click the file browser’s save button. Upload to MapBox. Login to MapBox’s website and click “Upload Layer”. Browse to your project folder, select the .mbtiles folder, and click “Upload file”. Upon a successful upload, your map will display. Embed it in your website. Click the “Share” button in the upper left corner of your map and copy the embed code. Paste this into the HTML source code of a webpage (or in a WordPress post) and save that (I’m not going to provide instructions on how to do that). 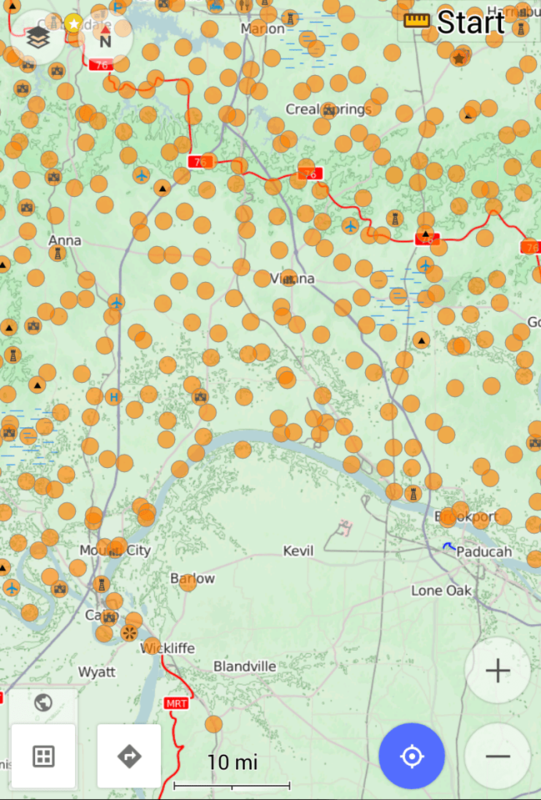 Now you know how to find geographic data, build a custom map using the TileMill application, begin to understand how to style it, and embed your map for the public on a website or blog. N.B. I was originally going to use QGIS to build a map and then publish a static image before I realized that TileMill + MapBox (the website) can build a map but publish an interactive feature instead of a static image. I’m happy I went that route. However, I did use QGIS to verify the data and even create a new shapefile of just a few of the key train stations on the Lincoln Service (the centerpiece of my Grid Chicago article).